You have options aplenty if you want to stay in a room with a past. The Chattanooga Choo Choo hotel is a converted train station, which served all trains traveling southward from 1909 to 1970. The Bluff View Inn is a romantic B&B located in three turn-of-the-century homes, once owned by Chattanooga’s elite. The Dwell Hotel was once part of Fort James, a stone fort used in the Civil War. It was converted to a hotel after the war and after many decades in disrepair, reopened with a new look and feel in 2016. Finally, The Read House opened in 1926 and offers rich architectural details, historic charm and plenty of local lore. 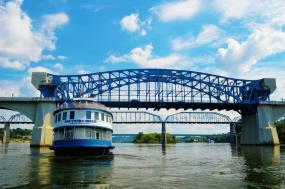 You’ll want to start your day with an overview of Chattanooga’s history. A riverboat cruise highlights the rich resources of the Tennessee River Gorge (the reason we’ve been so darn popular for about the last 10,000 years). Expect lots of wildlife sightings and history of Chattanooga’s first inhabitants – the Native Americans. Chattanooga Ducks will also get you in the water and offers a kid-friendly highlight of Chattanooga’s past. Once you’ve soaked up the history of downtown, head to an equally intriguing neighborhood – Chattanooga’s Southside. Once the financial hub of the city, the abandoned warehouses and old buildings are now occupied by restaurants, shops, and art galleries. The Terminal Brewhouse is located in the revitalized Stong Building, a hotel built in 1909 for weary train travelers. Gourmet burger bar Urban Stack is housed in the former Southern Railway Baggage Building, one of the oldest buildings in the city. 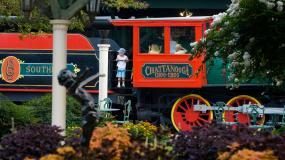 After a quick lunch break, indulge in more rail history with a walk through the Chattanooga Choo Choo hotel. If you’re artistically inclined,be sure to peruse some of the Southside’s art galleries, located about a block up Main Street. After a full day, head to the Bluff View Art District for a dinner made for the history books. Not only is the food particularly memorable – including the homemade pasta at Tony’s, the creamy shrimp and grits of Back Inn Café, or the light-as-air desserts at Rembrandt’s – but the setting is steeped in history. At the turn of the 20th century, Chattanooga was booming with wealth and industry. Some of the wealthiest citizens of the day built their homes in the Bluff View neighborhood, often referred to as “cliff dwellers” given their lofty location above the Tennessee River. In the early ‘90s, Dr. Charles and Mary Portera set about revitalizing the abandoned buildings by creating what’s known today as the Bluff View Art District – a European oasis up the hill from downtown. Cap off the evening with an offbeat history lesson from Chattanooga Ghost Tours (the Hunter Museum of American Art is one of the most haunted sites in town) or a ride around town on Chattanooga Horse Trams. After a day in Chattanooga you’ll learn that the Civil War is a big part of our story. 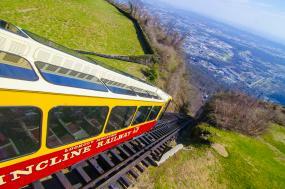 Spend day 2 immersing yourself in the historic battle that took place on nearby Lookout Mountain, called the “Battle Above the Clouds.” Ride up the mountain on the Lookout Mountain Incline Railway and take the short walk to Point Park, where Union soldiers surprised Confederates by sneaking up the mountain during an unusually thick fog. Be sure to check out the Battles for Chattanooga. A newly renovated visitor center houses a 33 by 13 foot mural by James Walker, an eyewitness to the battle, and several short audio presentations. A handful of lunch options exist on the mountain but if you want to incorporate a historic site, dine at Rock City Gardens Café 7 (open April to October). 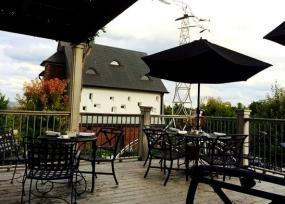 The upscale Southern menu is accompanied by an unbeatable view from Lover’s Leap. You have to purchase a general admission ticket but Rock City Gardens has an interesting history of its own, being a top tourist destination since the Great Depression. Another Lookout attraction with a fascinating back story is Ruby Falls, a 145-foot underground waterfall discovered in 1928 by local cave explorer, Leo Lambert. In keeping with the Civil War theme, spend day 3 in Chattanooga in nearby Chickamauga. 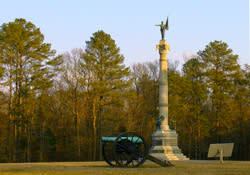 The most significant site is the Chickamauga Battlefield, where the Union Army suffered its most substantial defeat in the Western Theater. 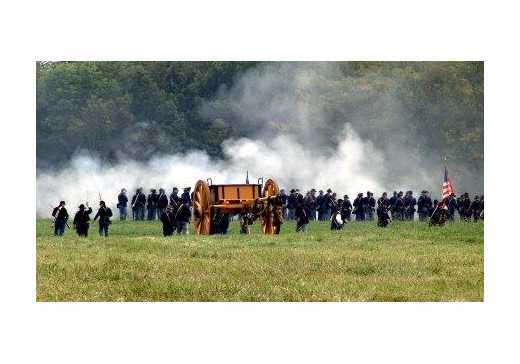 Today it’s the oldest and largest military park in the nation. Tours by park rangers take place at 10 a.m. and 2 p.m. and last about two hours. They’re daily during the spring and summer but move to weekends in the winter. You can also navigate your own cell-phone guided tour by car, which can take anywhere from 1 ½ to 3 hours. If you’re into military history, the nearby 6th Calvary Museum is a must-see, honoring the “Fighting Sixth” Calvary, which saw action in the Civil War, Indian Wars and the Spanish-American War. After WWI, the regiment was permanently stationed at its current Fort Oglethorpe location (1919-1942) which today houses artifacts, uniforms weapons, vehicles and more. Next head to downtown Chickamauga, a charming town with several historic stops like Gordon Lee Mansion, the Coke Ovens and Crawfish Spring. Grab lunch at one of the local restaurants and poke around the boutiques and antique shops on the town square. Puckett’s Grocery & Restaurant is a friendly community kitchen, with live pickin’ performances just a few feet from your table. 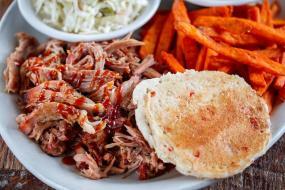 They serve authentic comfort food like barbecue, smoked slow ‘n’ low over cherry wood, plus home-cooked sides, and upscale dishes like a delectable, hand-cut filet mignon. Three-mile hiking trail near downtown, GPS Coordinates: 35.03813, -85.337763? ?